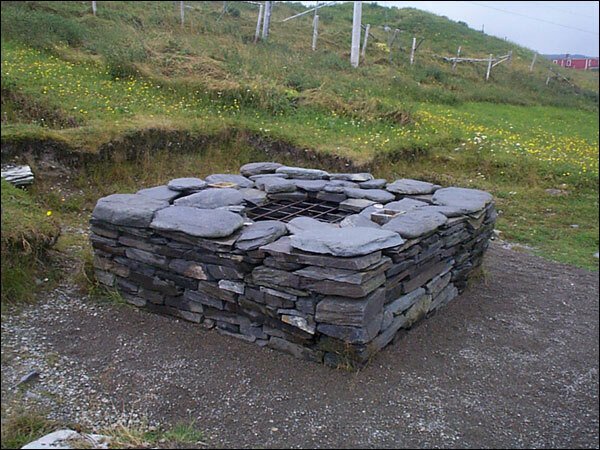 A Ferryland legend of long standing held that a well existed somewhere in the vicinity of our excavations. The story relates how the well had stood abandoned long after its use as a water source, and that a child had fallen into the well and drowned. As a result, residents filled the well. At various times over the last 30 years the location of the well has been pointed out at various places in the 10 or so acres surrounding the site of Avalon. 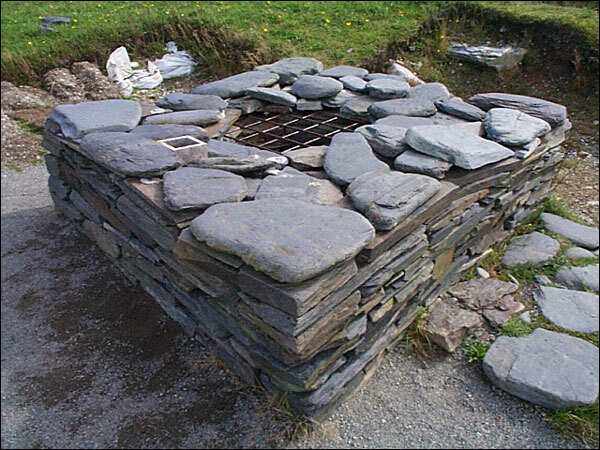 In the summer of 1994, Mr. Wilfred Costello, an older resident of Ferryland and owner of the land upon which we were excavating a 17th-century house, offered to locate the well. He led us to an unremarkable piece of meadow a little south of the house, pointed to the ground and indicated that the well was precisely in that location. Somewhat skeptically we agreed to test the area and, after about a half-day's work, came upon the upper courses of what was clearly a stone-lined well. The well had long remained hidden. After some delay to obtain sections of steel culvert to lower into the well as excavation proceeded, we began to remove tons of rock. It soon became clear that the well had been deliberately filled. At a depth of 7.6 metres (25 feet) below the present surface we reached the bottom. Four great timbers had been placed as a foundation, a row of bricks set as headers was placed atop them and the stonework commenced for 7.3 metres (24 feet) above the bricks. Somewhat to our disappointment, little refuse had accumulated at the bottom of the well. Some heavy iron bars and several axe heads were probably once attached to the sides of buckets to cause them to tip and fill when they were lowered into the well. Bits of what appear to be the framework for the lifting mechanism, parts of several buckets and a few sherds of glass and ceramic were about all that remained. Eventually a sherd of glass from the well was discovered to match glass from the nearby house site, suggesting that the two were contemporaneous. The well, then, seems to have been dug while the house was in use, sometime in the second half of the 17th century. Even more interesting were sherds of glass from the fill, all dating to the last decade or so of the 18th century, the time at which the well was filled. There seemed to be little doubt, therefore, that the well was that of the legend, and that the story had persisted for about 200 years-a remarkably accurate piece of oral history. Remarkably, the story of the well – dug sometime in the late 1600s — and its precise location has remained engrained in local folklore for nearly 200 years. Reproduced by permission of the Archaeology Unit, Memorial University of Newfoundland, St. John's, NL. When Mr. Costello returned for one of his periodic visits, he was asked why he knew the location of the well while so many others had placed it in various parts of the site. His reply: "Because I paid attention"; and he went on to relate who told him, who told her, and so on back to the latter part of the 19th century. The moral of the story is obvious.